Imagine relaxing in a bed full of Bulgarian rose petals. Just lying there with your eyes closed, laying back, relaxing, breathing deeply, in and out, taking slow deep breaths and meditating. That is what it is like to wear the new R+R Mask from Summer Fridays. This mask will give you petal-soft skin, smooth out any roughness and is a spa worthy mask that features delicately ground wild rose powder to whisk away dead skin cells that make the skin look dull and sallow. Also included in the mask are a dream team of antioxidant-rich oils: Argan, safflower, sesame, avocado and grape seed, that steep skin in luxurious moisture. These oils contain nourishing fatty acids and aid in anti-inflammatory healing of the skin. It doesn't contain any phthalates, surfactants, petrolatums, BHT, BHA or silicones. I bet you are asking, "how do I use this wonderful mask?" Easy peesy! On dry, cleansed skin, apply to face, neck and décolletage. Gently massage, avoiding eye area. Leave on for at least 10 minutes. Remove mask grains with a damp wash cloth and pat remaining oils into skin for a beautiful, nourishing glow. Use whenever you need to revive skin and have to have more radiance to your skin. Trust me, you will love it. 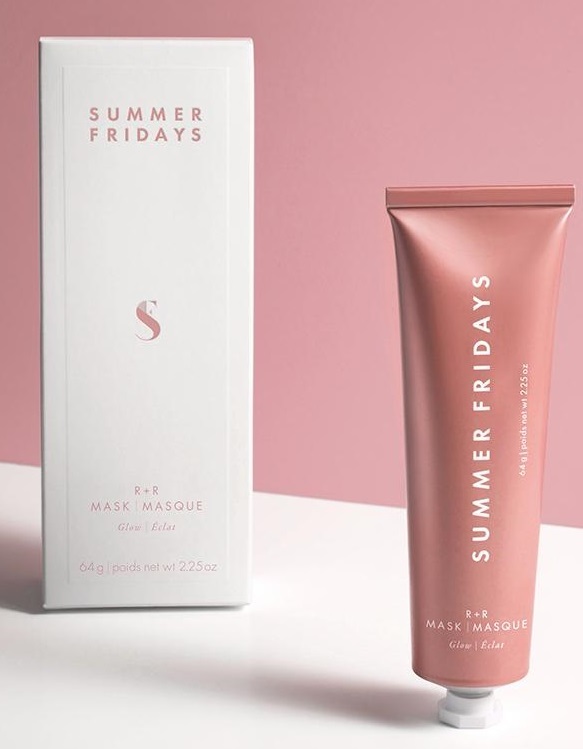 "This mask is like giving your skin a big bouquet of all your favorite facial oils wrapped up in a glow-buffing bow" Marianna + Lauren, founders of Summer Fridays. Does it work well? Heck yes! This 2-in-1 mask is amazing. I used it the other night before going to bed and I decided I was going to have it on overnight and see how my skin would fare in the morning. OMG. My skin looked so good in the morning. I put it on, massaged it for about 5 minutes then left it on for about a half an hour. Then I used a warm, damp wash cloth to wash off the grains. I left the oils on overnight and my skin was glowing the next morning. One of the main ingredients in this mask is Bulgarian Rose essential oil. That makes it intoxicating to the senses. It also contains rose flower powder to help exfoliate the skin. Even the most sensitive of skins could use this mask. I would recommend this mask for all skin types except acneic skins. I don't think the exfoliatin would work well for skin with papules on it. Otherwise, even oily skins could benefit from the oils and exfoliation in this mask. Argan oil is loaded with antioxidants, essential fatty acids and anti-inflammatory powers that help reduce hyperpigmentation and scars. The other oils (safflower, sesame, avocado and grape seed) are loaded with the smoothest skin-nourishing oils so your complexion can luxuriate in a power-shot of fatty acids, vitamins and antioxidants. If you are like me and love a good mask to make your skin come alive, then pick the R+R Mask. This mask is vegan, cruelty-free, doesn't contain any synthetic dyes or fragrances, is sulfate free, is paraben free and was Made in the USA. 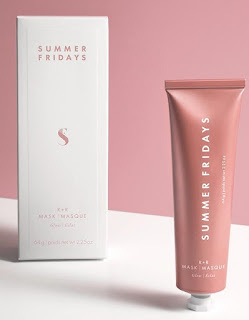 Summer Fridays R+R Mask can be found online at www.summerfridays.com and www.sephora.com. Like Summer Fridays on Facebook: http://facebook.com/summerfridaysbeauty; Follow Summer Fridays on Twitter: @summer__fridays and Follow Summer Fridays on Instagram: https://www.instagram.com/summerfridays/.